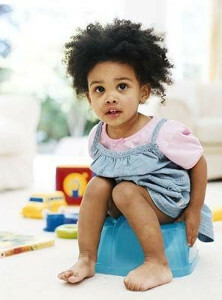 It can be hard to figure out when it is the right time to potty train your child. It is really a decision that can only be made by the child. For some reason, today's parents just don't seem to want to take the time to wait for their child to be ready to potty train and instead force them into doing it early. I hate to admit it, but that's how I felt as well. Maybe it's just this fast paced society we now live in that's contributing to this feeling of extreme urgency, but either way, this is a real problem that can cause all sorts of problems for the child if he or she isn't ready to begin the process. When your child shows that they are ready for potty training, it's time for you to begin introducing him or her to the potty. You need to choose a comfortable potty chair that will make potty training fun for your child and is also easy for you to clean. If you are not sure which chairs your child will like, bring him with you when you choose it. Quick tips: Give your child a bit more liquids so that you can increase potty training chances. This will help your child to build muscle memory and help your child potty train quickly. Take your child to the potty every thirty minutes and on time. Have your child sit for a couple of minutes and read a book together while he's still on the potty. Turn on the faucet or place your child's feet in warm water to encourage urination. Don't you remember that sleep over trick that you pulled on your friends? It will work on baby too! Just remember to relax and not stress so much over this whole potty training thing. It will happen soon enough.